When you think about hair loss and you think about hair turning gray, most people usually consider them to be separate conditions. Both are often connected with aging, but some people start to lose their hair when they’re young, while other people gray prematurely. The treatments are different and they’re usually studied separately, but recent research may have come up with a breakthrough in both hair loss and graying hair. At RHRLI we want our patients to know all the information they can gather about thinning hair, so we’d like to tell you about this research. And if you learn a bit about gray hair, that’s great too. If you’re looking for a permanent solution to hair loss, RHRLI has it. It’s called the ARTAS® system and it uses robotic technology to give you a fuller, healthier head of hair. In May 2017, researchers from the University of Texas Southwestern Medical Center were able to pinpoint the cells that cause us to lose hair as well as the cells that cause gray hair, according to Time Magazine. But that’s not what they were initially looking for. According to Medical News Today, they were investigating a genetic disorder called neurofibromatosis type 1 (NF1), which, among other things causes tumors to grow on nerves. Instead, according to findings published in the journal, Genes & Development, the researchers found a protein called KROX20 which has a relationship to hair. This protein is commonly associated with nerve development, but the researchers discovered that KROX20 is produced by skin cells that become hair shafts. When researchers deleted the KROX20 producing cells on mice, they discovered that hair stopped growing. As for gray hair, KROX20 works with another protein called stem cell factor (SCF), according to a press release from UT Southwestern Medical Center. SCF is produced when the KROX20 protein begins to grow hair. The researchers discovered that SCF is essential to hair pigmentation and that when the SCF gene was deleted from the cells generating hair in mice, the animal’s hair began turning white. “Although this project was started in an effort to understand how certain kinds of tumors form, we ended up learning why hair turns gray and discovering the identity of the cell that directly gives rise to hair,” said Dr. Lu Le, Associate Professor of Dermatology at UT Southwestern. 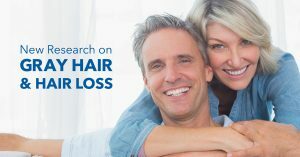 Further research is needed to see if the same results occur on humans and the researchers hope in the future that a way can be found to deliver the necessary genes to hair follicles to correct hair loss and graying. In the meantime, RHRLI is the only hair treatment center on Long Island that offers the ARTAS® system. It’s a non-invasive transplant procedure that uses robotic technology to find healthy donor hairs and transplants them to where they’re needed. To get started, contact RHRLI today.